Here is how to make a great video game featuring licensed characters. Step one: find a great video game. Step two: put characters from We Bare Bears, Steven Universe and Adventure Time in it. That’s pretty much how Cartoon Network Match Land was born. I’m barely exaggerating here. Last year indie developer Race Cat Games released Match Land, a delightful little free-to-play pixel art puzzle RPG that captured my heart with its adorable look, combo-based match-three mechanics and modest microtransactions. It’s a charming game that I played daily for most of 2017. According to Chris Waldron, Cartoon Network’s vice president of digital products and games, his team was similarly enthralled. The original Match Land. Look at them lil snakes. And so Joel Nelson reached out to Race Cat Games, and now Cartoon Network Match Land is coming out March 21 on iOS and Android. There was probably some programming and stuff between the first and second thing, but you get the idea. 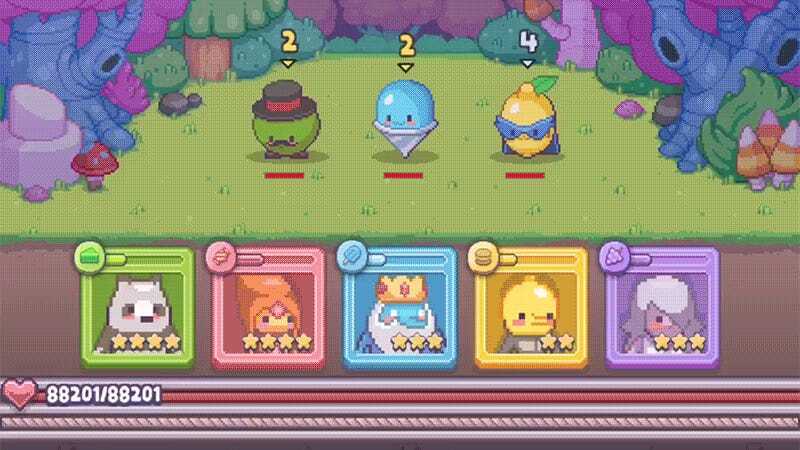 Instead of a team of random fantasy characters, players form a team from collectible Cartoon Network characters. Instead of fighting animals, the player’s team is tasked with taking down evil edibles. And instead of unlocking a series of fantasy-themed shops that provide materials needed to upgrade characters, here it’s food stalls and trucks. Otherwise, the only major difference between the original Match Land and Cartoon Network Match Land is the new game allows players to move gems diagonally to match, speeding up the combo countdown timer (how long the player has to make another match, continuing the combo) to counterbalance the extra freedom of movement. I’ve been playing a test build of the game for a couple of weeks now, and it’s like coming home, only this home is filled with talking bears, Crystal Gems and denizens of Ooo. And isn’t it nice that Cartoon Network went to the original developer instead of just making their own version? It’s a mobile gaming miracle.